Easy to care for and easy to wear, this skirt will be a go-to this summer. Linen is great because it’s natural state is a little wrinkly, so there’s no need to stress about rumples. It also tends to shrink in the dryer, so be careful with it if you like the fit. For example, this J.Crew linen shirt shrank quite a bit for me in the wash. I love the new shrunken fit, but if you’d rather not have your linen items shrink, you may want to consider air drying. Petite Fashion Challenge: A Petite "Don’t"
I love those pumps, what a color! 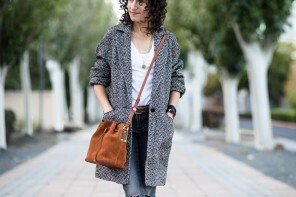 What a simple but put together look. Love the belted skirt, and the tucked in shirt. Gorgeous! That skirt is a great shade of blue! Love the Spanish tiles in the background. They remind me of the restaurant, Islands! I grew up in LA country and that was my favorite place to eat. i just bought 2 linen skirts from jcrew. so cute! Good question Kay. I haven’t seen it in a store, and the product page doesn’t have the “find in store” link that most products have. Makes me think it could be online only. I love linen. It is so easy to care for. Just a word of advice: it dries fairly quickly without machine drying, just hang up or put on a drying rack. I almost always air dry all my linen clothing and sheets. the skirt looks perfect on you! 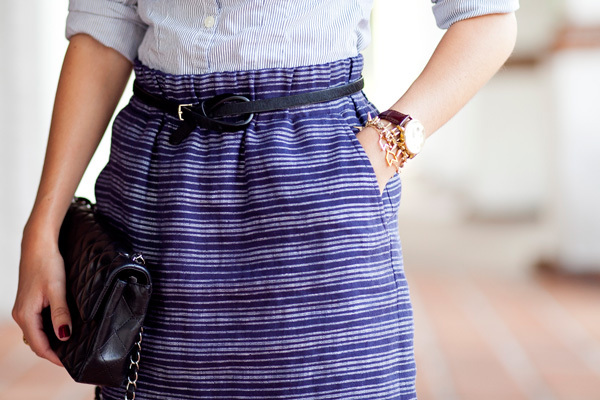 i love the j. crew linen skirt, hoping to get one later this summer. i’m always a little hesitant about linen. i hate the creases it gets when i sit. little wrinkles are ok, but creases… ugh. have a good weekend! Love the skirt! It has just the right volume and the shoes are perfect!